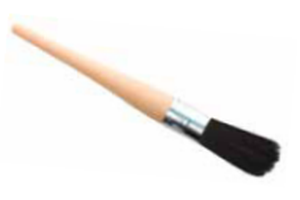 Parts Cleaning brushes are manufactured by inserting synthetic fill into a wood handle and securing with metal ferrule. Polypropylene is a high-quality, versatile filament with chemical and acid resistant properties. We have two standard product offerings for this brush with two widths and overall length options. The brushes come in standard packs of 12 units. These disposable brushes are excellent for cleaning hard-to-reach areas, especially when chemicals or acids are used. The filament allows this brush to be effective in heavy-duty parts cleaning applications.